We, Deench Corp., were established in 1992 as the first collated screws manufacturer in Taiwan and we also export. 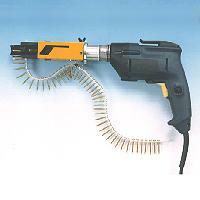 Our main products are collated screws, drywall screws, tapping screws, chipboard screws, screwdriver bits, auto feed attachments, and so on. Our collated screws have patents all over the world, like in the USA, Germany, Taiwan, etc. The biggest feature of Deench Corp. is that we are a complete collated screws system supplier: Material, Tape, Collated screws, Screwdriver bits, Auto feed attachment. Therefore, we can provide the most competitive terms to people in the collated screws market. So far, our major markets are in the USA, Europe, and Japan. For future markets, we are now continuously inventing potential products and would also like to be a sub-contractor in Taiwan.